New Mexico hosts the largest and most efficient livestock import and export facilities on the Mexican border. Almost a third of all cattle imported each year from Mexico are processed at New Mexico ports. This year approximately three hundred thousand head of cattle will pass through the Santa Teresa and Columbus facilities. Most cattle are feeder stock destined for pasture and feedlots in Texas, New Mexico, Arizona, California, and the Midwestern states. Even though most originate in Chihuahua, there is an increasing import trend from throughout Mexico. 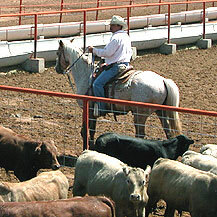 Horses and other livestock are also processed at New Mexico ports. New Mexico livestock facilities offer practical and economic advantages over other border crossings. Livestock are penned and processed at the border, then walked into the US, saving time and transportation costs while minimizing weight loss. Elsewhere, livestock must be trucked between processing facilities on each side of the border increasing costs and adding stress to the animals. First opened in 1991 and spanning the border approximately one mile east of the international port of entries, the Santa Teresa/Jeronimo livestock facilities are the most modern on the US/Mexico border with the capacity to process 5,000 livestock per day. At Columbus/Palomas port of entry, smaller facilities cater to the livestock producers of northwestern Mexico. Customs brokers can provide valuable assistance in dealing with all the involved agencies. For additional information, in English and Spanish, concerning facilities, regulations, and procedures call the Union Ganadera Regional de Chihuahua at (575) 589-1620. The New Mexico Department of Agriculture has a very successful marketing program for the export of breeding stock and other quality. For more information concerning the export program, contact Mr. David Lucero, Division Director with New Mexico state's Department of Agriculture, Marketing and Development Division, at the following phone number: Office - (575) 646-4929, Fax - (575) 646-3303.